You can configure additional alerts, or change the default settings of predefined alerts. 1. Go to Reports > Alerts > Alert settings. The Web filter violations alert comes predefined, but disabled, upon installation. The VPN certificate monitor comes predefined upon installation. The Outgoing Traffic Violations alert comes predefined upon installation. The System Resource Monitor comes predefined upon installation. The Firewall Notifications alert comes predefined upon installation.  Warning threshold — Enter the number of hits from the source IP addresses before the warning alert is triggered. 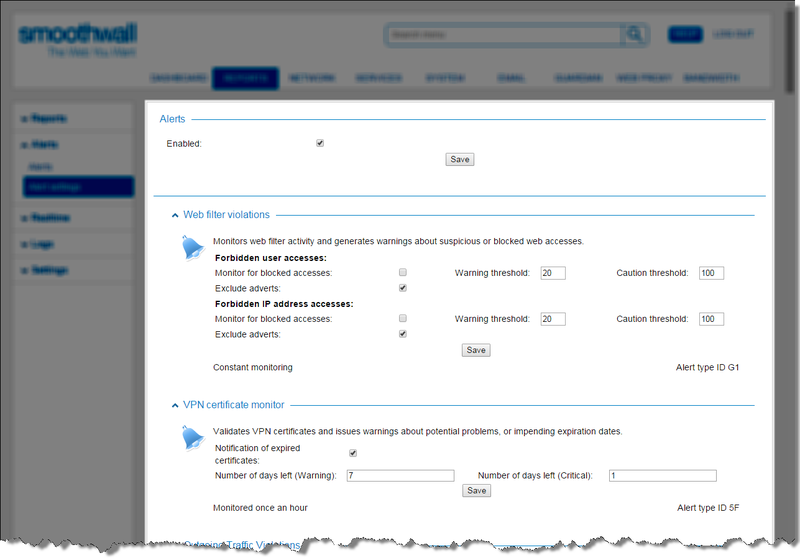  Incident threshold — Enter the number of hits from the source IP addresses before the incident alert is triggered.  Ignore — Enter a comma-separated list of source IP addresses that should be ignored for this alert. Clear the selection to disable this alert. This detects suspicious inbound communication from remote IP addresses. Alerts are generated if a rapid series of inbound requests from the same remote IP address is detected. This is the only parameter not enabled by default. Select this to enable this alert. This detects suspicious inbound communication from remote ports. Alerts are generated if a rapid series of inbound requests from the same remote port is detected. This detects suspicious inbound communication to local IP addresses. Alerts are generated if a rapid series of inbound requests to the same local IP address is detected. This detects suspicious inbound communication to local ports. Alerts are generated if a rapid series of inbound requests to the same local port is detected. The System Service Monitoring alert comes predefined upon installation. The Inappropriate word in IM Monitor comes predefined upon installation. The Intrusion System Monitor is predefined upon installation. The Global Proxy alert comes predefined upon installation.